To gather, protect, display and explain materials dating to World War I, a group has been formed to start a museum. “It is being shaped as a brand-new pilot project for the Navy museum system,” says Gary Wagner, a spokesman for the Naval Support Facility. 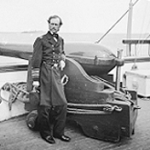 Rear Admiral John A. Dahlgren, for whom the Dahlgren Navy base is named, poses with namesake gun. The Navy tests the electromagnetic railgun at Dahlgren. The force of the current is so powerful that it can fire a metal projectile long distances at tremendous speeds. A team of ordnance officers and civilian workers install an advanced base mount on the main range at Dahlgren on June 30, 1939. The Roosevelt administration stepped up naval rearmament in the late 1930s. The Navy museum system comprises 13 sites around the country. “As a new feature, they are creating Navy Heritage Centers and using this project as a pilot for that new [model],” Wagner said. The museum will be run not by the Navy, but by the newly created Dahlgren Heritage Foundation. The base was established in 1918 as the Naval Proving Ground, to test guns destined for Navy warships. Over the years, the site along the Potomac River evolved into one of the Navy’s premier research and development labs. It includes a 25-mile firing range along the river. “Interest in establishing a museum about Dahlgren really took off following our celebration of the base’s 90th birthday in 2008,” Wagner said. The event brought together people in the community who had lived and worked on the base. Many of them thought a museum would be a good addition. Ed Jones, editor of The Free Lance-Star, spearheaded initial efforts to promote the idea to the Navy. Jones, who grew up on the base and whose father was a program manager with the former Naval Weapons Laboratory, said the timing is right. “The professionals on this base have done a good job of telling the story of what Dahlgren has contributed to our region and our nation, but we need a bigger megaphone. Coincidentally, the Naval Surface Warfare Center Dahlgren Division–the base’s largest tenant command–had already begun to collect and archive important documents and artifacts related to the command’s history. Base representatives, along with officials from the Naval History and Heritage Command, met in July and Jones was elected president of the foundation board.The next step is to finalize bylaws and a concept of what the museum will be, then going back to the community for help and guidance, Wagner said. “We’ll be looking for folks who can support this initiative in a number of ways, drawing on their expertise in multiple areas,” Jones said. Meanwhile, the group is exploring possible sites, which likely will be outside the base, so that it will be easier for the public to visit. Copyright 2010 The Free Lance-Star Publishing Company.